Can a small craft workshop become a place of resistance to the big evolutionary events in history? Is it possible to survive the digitalisation of typographic techniques and mass tourism? 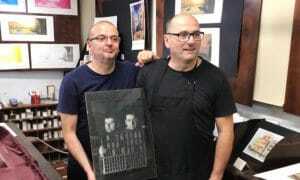 Luca and Michele’s printshop, Venezia Stampa, is here to tell us that it is indeed possible. It all started in 1989. Luca’s family was in the field, so he decided to follow his father’s footsteps, at a time when his peers where aspiring to a job in a bank; Michele grew up among pianos and sonatas, but he ended up preferring the measured rhythm of a print shop (can you think of a workshop richer in sounds than a print shop?). Michele draws and designs, Luca carries out the work, and manages the typesetting. The fact that all this is happening in Venice, the place where Aldus Manutius worked, who is considered the most important printer of the Renaissance, and the first publisher in the modern sense, for sure is not a coincidence. Hopefully he does not get offended by the fact that at the centre of the whole place there is a Heidelberg printing machine dated 1968, whose name reminds more of Gutenberg than the Venetian genius. Entering their print shop is a full sensory experience. The rhythmical sound of printing, the floating smell of ink, of paper, of lead, of lubricating oil, tells us that everything that we can admire around us, in a space that’s stuffed with posters, postcards, bookplates, and countless other paper artefacts, was made there, with love, sacrifices and the stubbornness of someone who thinks that in a time of social holidays, it is possible to send a handcrafted postcard from a city like Venice. “Festina lente”* so! * ”Make haste slowly” was Aldus Manutius’ motto, whose publishing logo was with a dolphin (representing speed) wrapped around an anchor (representing calm and stability). We hope that Michele and Luca don’t find us too easily influenced, but isn’t it curious that the funds needed to open the print shop, the famous 15 million Lire, were raised in a fish shop?